Your donations during the month of April will help us to build up the funds for future mission trips and donations to worthwhile causes. 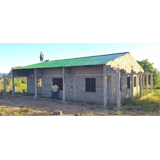 Above is a picture of the Health Clinic in the Tete Province in Mozambique, Africa that your donations have made pos- sible. A mission team will be traveling to Africa in June. They will be taking medicines thatyou donate with them. Please look for the suitcase in the Café area. Along with thesuitcase is a list of needed medicines. Thank you for your support!